Education within higher education is often divided into discipline-oriented and professional programs. Professional programs prepare students for a specific profession and include relevant theoretical- and practical knowledge. Discipline-oriented programs emphasize theoretical knowledge and research within a specific discipline or field. Except for a career within research and higher education, discipline-oriented programs provide less obvious links to future careers. The transition from student life to working life may therefore be challenging. In this paper, we present and discuss the development and implementation of a work placement course as part of the disciplinary programs in biology at the University of Bergen. The course was developed to provide students with practical- and work- related skills and competences, inform about future careers and to foster motivation and learning. We have revised the course according to feedback from students, workplace hosts and our experience during the six semesters the course has been running. The work placement course is at the bachelor (BSc) level and consists of two main components; the work placement itself and the student’s own reporting of placement outcomes. For the placement, the students work 140 hours at a workplace as a biologist. The reporting consists of four open blog-posts, one written reflective essay and a final oral presentation. The course teachers also meet with the students and convey information on the roles of biology and biologists in today’s society through a Facebook group. Feedback from the students, hosts and course teachers point to a range of benefits from work practice courses in discipline- oriented study programs. Based on our experience, we provide guidance for developing such courses as part of discipline-oriented curricula. Abbott, A. D. (1988). The system of professions : an essay on the division of expert labor. Chicago & London: University of Chicago Press. Aldas, T., Crispo, V., Johnson, N. and Price, T. A. (2010). Learning by Doing: The Wagner Plan from Classroom to Career. Peer Review 12(4) 24-28. Bennett, N., Dunne, E. and Carre, C. (1999). Patterns of core and generic skill provision in higher education. Higher Education 37(1) 71-93. Billett, S. (2009). Realising the educational worth of integrating work experiences in higher education. Studies in Higher Education 34(7) 827-843. Blickley, J. L., Deiner, K., Garbach, K., Lacher, I., Meek, M. H., Porensky, L. M., Wilkerson, M. L., Winford, E. M. and Schwartz, M. W. (2013). Graduate Student's Guide to Necessary Skills for Nonacademic Conservation Careers. Conservation Biology 27(1) 24-34. Bogo, M. (2006). Field Instruction in Social Work. The Clinical Supervisor 24(1-2) 163-193. Cakir, H. (2013). Use of blogs in pre-service teacher education to improve student engagement. Computers & Education 68 244-252. Dewey, J. (2011). Democracy and Education. Hollywood: Simon & Brown. Dreyfus, H. L. and Dreyfus, S. E. (1986). Mind over machine: the power of human intuition and expertise in the era of the computer. New York: Free Press. Edwards, H., Smith, S., Courtney, M., Finlayson, K. and Chapman, H. (2004). The impact of clinical placement location on nursing students' competence and preparedness for practice. Nurse Educ Today 24(4) 248-255. Freeman, S., Eddy, S. L., McDonough, M., Smith, M. K., Okoroafor, N., Jordt, H. and Wenderoth, M. P. (2014). Active learning increases student performance in science, engineering, and mathematics. Proceedings of the National Academy of Sciences 111(23) 8410-8415. Gardner, J. and Belland, B. R. (2012). A Conceptual Framework for Organizing Active Learning Experiences in Biology Instruction. Journal of Science Education and Technology 21(4) 465-475. Gjerde, A. S. (2016). Gjør biologistudenter til yrkesfagelever. Dagens Næringsliv. Hole, T. N., Jeno, L. M., Holtermann, K., Raaheim, A., Velle, G., Simonelli, A. L. and Vandvik, V. (2016). bioCEED Survey 2015. Retrieved from University of Bergen, BORA – Bergen Open Research Archive: http://hdl.handle.net/1956/11952 78 pp. Hyland, T. and Johnson, S. (1998). Of Cabbages and Key Skills: exploding the mythology of core transferable skills in post‐school education. Journal of Further and Higher Education 22(2) 163-172. Kennedy, M., Billett, S., Gherardi, S. and Grealish, L. (2015). Practice-based learning in higher education: jostling cultures. New York, NY: Springer Berlin Heidelberg. Korthagan, F. and Kessels, J. (1999). Linking theory and practice: Changing the pedagogy of teacher education. Educational Researcher 28(4) 4-17. Kyndt, E., Dochy, F., Struyven, K. and Cascallar, E. (2011). The direct and indirect effect of motivation for learning on students' approaches to learning through the perceptions of workload and task complexity. Higher Education Research & Development 30(2) 135-150. Matthew, S. M., Taylor, R. M. and Ellis, R. A. (2012). Relationships between students' experiences of learning in an undergraduate internship programme and new graduates' experiences of professional practice. Higher Education 64(4) 529-542. NOKUT (2014). The Norwegian Agency for Quality Assurance in Education www.studiebarometeret.no. Næss, T., Thune, T., Støren, L. A. and Vabø, A. (2012). Samarbeid med arbeidslivet i studietiden. Omfang, typer og nytte av samarbeid. STEPOECD (2010-2011) AHELO: Assessment of higher education learning outcomes. Oslo: NIFU Skriftserie. Olsen, D. R. (2016). Re: «fremragende utdannelse» @UiB ble til yrkesskole, skriver @DN_no Men kritikken treffer ikke http://www.dn.no/talent/2016/02/18/2145/Utdannelse/gjr-biologistudenter-til-yrkesfagelever … @evagrinde @sfubioceed. February 16. Available at: https://twitter.com/UiBrector_Olsen/status/700577694422007808. Polanyi, M. (1967). The tacit dimension. Garden City, NY: Doubleday Anchor. Regjeringen, ed. (2014). Long-term plan for research and higher education 2015–2024. Oslo, The Norwegian Ministry of Education. Regjeringen, ed. (2017). 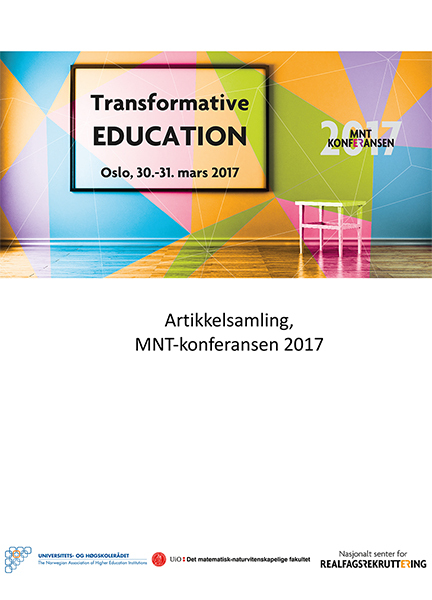 Kultur for kvalitet i høyere utdanning (Culture for quality in higher education). Oslo, The Norwegian Ministry of Education. Ryssevik, J., Høgestøl, A., Dahle, M. and Holthe, I. C. (2011). Kompetanse 2020 - Universitetsutdanningenes synlighet og relevans og samfunnets behov. Bergen, IDEAS2EVIDENCE Rapport 4 / 2011. 208 pp. Scholz, R. W., Steiner, R. and Hansmann, R. (2004). Role of internship in higher education in environmental sciences. Journal of Research in Science Teaching 41(1) 24-46. Schön, D. A. (1987). Educating the Reflective Practitioner. San Fransisco: Jossey Bass Publ. Simons, L., Fehr, L., Blank, N., Connell, H., Georganas, D., Fernandez, D. and Peterson, V. (2012). Lessons Learned from Experiential Learning: What Do Students Learn from a Practicum/ Internship. International Journal of Teaching and Learning in Higher Education 24(3) 325-334. Singer, S. R., Nielsen, N. R. and Schweingruber, H. A. (2013). Biology Education Research: Lessons and Future Directions. CBE-Life Sciences Education 12(2) 129-132. UiB (2017). Kvalitet i utdanning. Handlingsplan 2017-2022 (Quality in education. Action plan 2017-2022). University of Bergen. Wurdinger, S. and Carlson, J. (2009). Teaching for Experiential Learning: Five Approaches That Work. New York, NY, United States: Rowman & Littlefield Education. The Nordic Journal of STEM Education licenses all content of the journal under a Creative Commons Attribution (CC-BY) licence. This means, among other things, that anyone is free to copy and distribute the content, as long as they give proper credit to the author(s) and the journal. For further information, see Creative Commons website for human readable or lawyer readable versions.